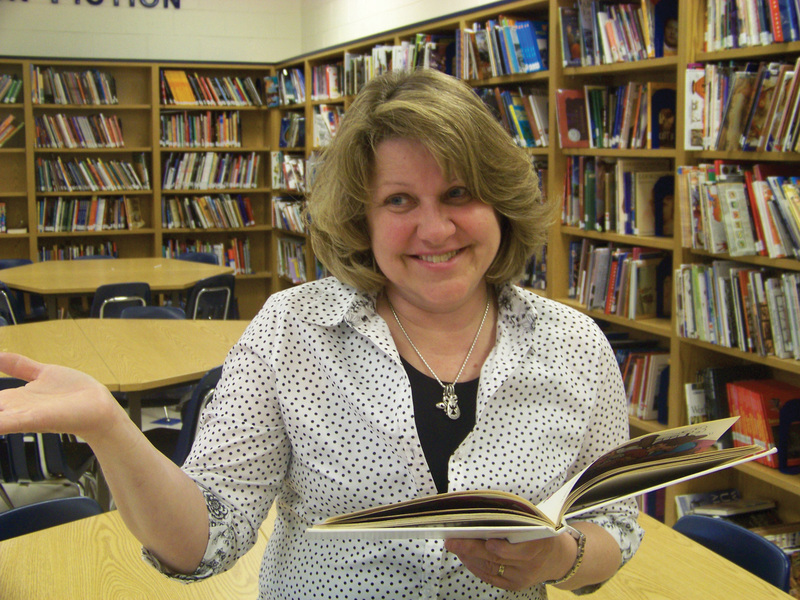 Librarian, Mattoon Middle School, Mattoon, IL. I had the pleasure of meeting Anieta Trame for the first time at the Illinois Library Association (ILA) Awards Luncheon where she received the Hugh C. Atkinson Memorial/Demco Award. 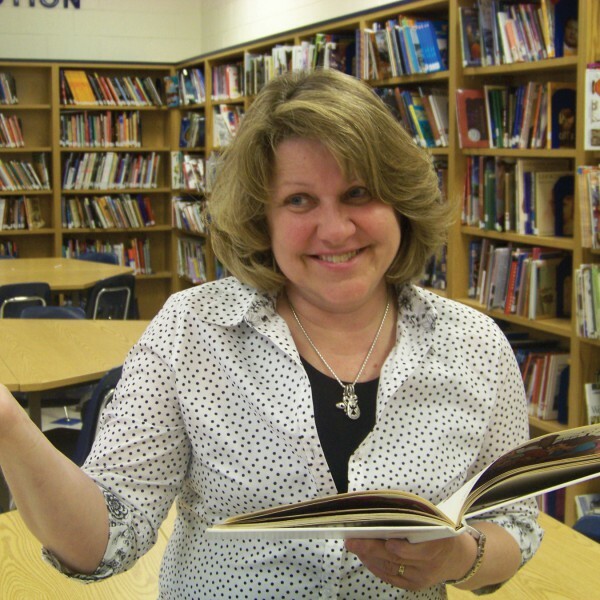 It was clear from the beginning the passion that she has for her students, her work as a librarian and the dramatic difference she is making in teens’ lives. Mattoon is a small town in Central Illinois with a population of about 18,000. In a community of this size, the level of support that Mattoon Middle School has been able to garner for their reading initiative both from student and outside participation and financial standpoints has been outstanding. I was struck by how she was using the entire experience as a teaching and learning activity that engages her middle school students and truly develops leaders. She had fantastic stories of how students were able to embrace this challenge and grow to do things that they never thought themselves capable of. I loved this refreshing approach to community service for teens. Anieta relayed to me the story of a student who wanted to get involved but was afraid of presenting in front of groups — part of the requirement to be involved in the Student Reading Committee. With Anieta’s encouragement, the girl joined and became one of the group’s best speakers. This is a skill that will last her entire lifetime and it’s impressive to have development activities like this at the middle school level. Anieta also said that the school’s best leaders tend to come from this group. Anieta was gracious enough to share more information about their program so your library can benefit from these winning community engagement practices. As a new librarian, I was given the task to get kids to reading. Our circulation numbers were low with only 800 books in circulation. Now we circulate 40,000 books a year. Starting out, I was looking for some way to make reading important. When I heard about the One Book, One Chicago program, I wanted to do it here. businesses to make a case for reading. To get more of the community reading, we launched a school library/community reading initiative in 2002, modeled after the One Book, One Chicago. We called our program Read Across Mattoon. Our key innovation in the program was putting it in the hands of the students. A committee of students chooses a book and our entire school reads it in December. The students chose “The False Prince” by Jennifer A. Nielsen as their book choice this year. 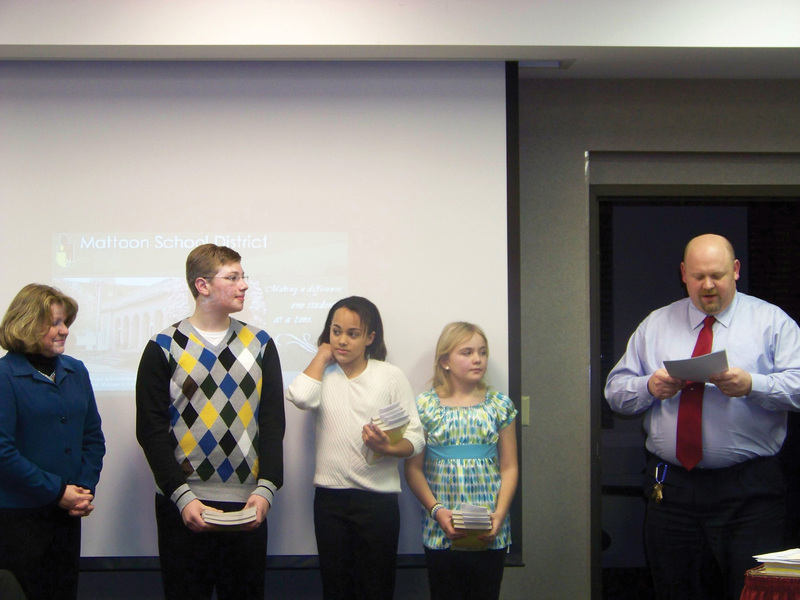 In January, students challenge 35 businesses to read the book and pass it on. In addition, students speak to 25 different local organizations to promote the program and help secure funding to keep it going. We found that having kids recommend books provides greater buy-in, the community believes the kids because the kids believe in the program. Adults tend to be supportive when kids show that kind of leadership role and kids challenge them to read results in a high level of engagement. Our program is currently in year 13 and continues to expand. If the money was there, we would do more books in the community. Our goal is also to raise literacy in our community not just for this year, but for the future. We have built good readers and it will continue to grow. To further extend this project, the kids choose the books in our library. We take groups of kids to Barnes & Noble and they make the selections. Working with the small budget I have, they spend our money. Word of mouth is a beautiful thing too because the businesses in our community pitch in and support this program with additional funds. The Student Reading Committee, has no limit on the number of students who can be a part of it. We had 73 members last year. While I would never want to turn students away, we have 45 students on the committee this year and it is more manageable. We have book discussions every Friday morning and anyone can sit in and listen to the student reading committee talk about books. The phenomenal librarians in our elementary school talk up the middle school’s community reading program so students coming to Mattoon Middle School are already interested. We have no problem finding students who want to be part of this program. The first year we had 18 students and teachers handpicked them. We found that just because you’re a good reader doesn’t mean you like to read or you can take it to the community. In addition, if you volunteer, you’re more invested. Every year since, our Student Reading Committee is open to everyone. 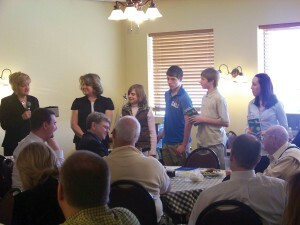 Mattoon Middle School students attend breakfast meeting. There are numerous ways the community is involved: 3 representatives from outside organizations are on the program’s board. A philanthropic education organization, a sorority and our public library collaborate with us; the Kiwanis are involved too. Every year, Kiwanis has a different theme they want to fund. They gave us the award when it was the literacy theme. Our students may volunteer for their pancake breakfasts and observe their meetings in order to understand their involvement in our community. This supports the future of Mattoon. We raise $6,000 a year for the program (about $6.00 per book) and we give away 1,000 books. Of those, 240-300 go to the service groups that we are associated with. It’s a privilege for them to get this book and, at the meetings where the books are distributed, the organizations and businesses sincerely make our kids feel good. Each recipient is asked to pass the book on when finished. The students stuff 10 postcards into each book. Recipients then mail these postcards back to us and we use that information to pick the next book. With about 1,000 books circulating and recirculating, it’s possible to touch about 20% of our community. One year, we sent all of our books to the American Red Cross to go to our service people. Our program kickstarted a love of the library. Over lunch, 50–60 students come here to play games. They want to be in the place they helped create. There are 100 books added to our collection from each year’s challenge and some of the teachers will teach the book as the class novel. Our principal was very supportive of this program. He went on to become the superintendent. We now have people in higher places who support us and who hold libraries in high esteem and help us advocate for what we need. The “Out of My Mind” book selection by Sharon M. Draper resulted in greater awareness of autism. A woman in our community who received this book also happened to have an autistic child and she was so grateful to us for helping fight stereotypes and give people an understanding of what autism is and isn’t. Students intentionally choose books with a lot of meaning and the program fosters critical connections. When we needed to expand our library and didn’t have the money to do so, we raised $48,000 with help from our community. Another time, a gentleman who heard about this program, handed me a check for $30,000. Both of these generous gifts resulted from our presence in the community. I find it amazing what the power of a good book and the power of caring for a community can do. My advice is to let kids be in charge. I know it’s really hard as educators to turn over control, but we need to. My job is facilitating and helping the students get from point A to point B without getting in their way. If you let students dream, and as adults help them achieve, there isn’t anything that can’t be achieved. Prove they are in charge and have the confidence that they can self-lead. Raising the money is really hard, but somehow we figure it out. A community member out of the clear blue sky may send a check for $1,000 because they believe in the program. It is a lot of hard work and you have to have people willing to do the extra. The results show it is all well worth it. This is very much a group effort. I have 5 teacher volunteers, 3 community board members, a supportive administrative staff and a library assistant. The growth has been astounding. Starting out, students spoke to 4 community groups. This year, we will speak to 25-30 groups. Originally books went into 4 businesses, now we have 35. The first program cost $400 and we distributed 100 books. This year it cost $6,000 and we gave away 1,000 books. Everything started from the idea that this was intended to be a 1-year initiative. That was 13 years ago. I’m retiring the end of this year and I’m hoping that my replacement will take up this program! Previous How Using Apps in Storytime Can Be a Good Thing	Next Play It Again! Grant Writing Tips for Every Library!